When we think of all the features set in place to protect and shield our home from the outside elements, rarely do we think about our eavestroughs as one of the most important. Proper drainage is essential in preventing leaks in your homes roof, foundation, windows and exterior walls. How many times have you heard one of your family members or close friends complaining about a flooded basement when the heavy spring rains arrive? More often then not it is because the water is not properly draining away from their house, due to old or poorly performing eavestroughs. It is vital that the water travelling down our roofs and into our eavestrough is carried through downspouts far enough away from the home that it does not makes it way back to the foundation walls. 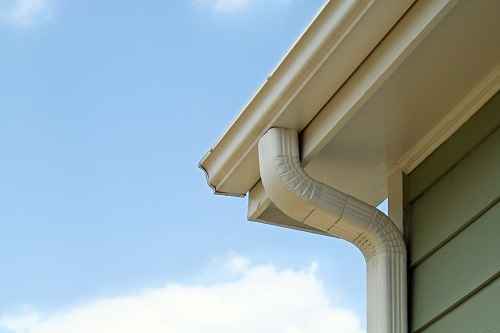 The width of your eavestrough is also a key factor when discussing proper drainage. In some cases, the eavestrough on your home may be insufficient in size to adequately displace the amount of water from your roof. When it comes to your homes eavestrough, H&J Roofing and Exteriors is here to help you make the right choice. 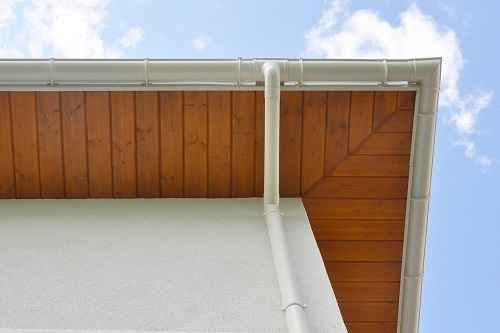 The soffit on our home plays an integral role in maintaining proper ventilation. Proper ventilation is essential to prevent moisture build-up, which can lead to mould, mildew and rot. As we all know Calgary is subject to extreme temperature changes both in winter and summer. These changes in temperature can make our homes more prone to moisture, which is why in Calgary proper ventilation is a must. The fascia on our home is the surface behind the eavestrough. Most homes use aluminum for the fascia material since it is incredibly durable. The function of your home’s fascia is to provide a place for your eavestroughs to attach to while protecting the fascia board from the water that gets displaced by both the roof and trough. If you are thinking about replacing your eavestroughs, soffit or fascia it is important you hire a professional. A professional contractor will properly measure out the job and slope the eavestrough to the point where it is unnoticeable to the eye. Most homeowners will not have the ability to slope the trough properly so that the water runs away from the home. As we touch on early about the importance of your eavestrough, making sure water is directed away from the home will prevent any costly flooding and damage to your home. If you are a Calgary homeowner give us a call today at (587) 433-9746. Our team of experts will be more than happy to help you. Give us a call or send us a quick message!